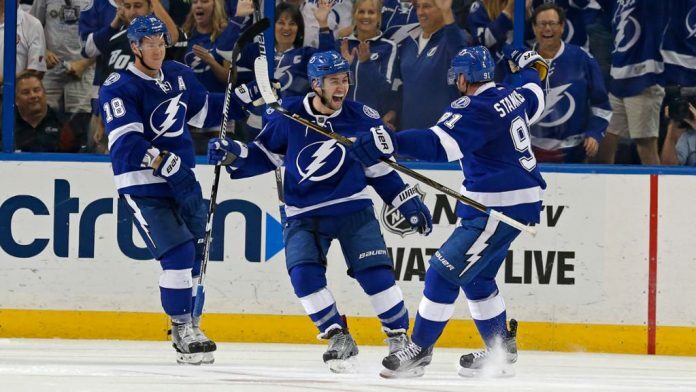 What will the Tampa Bay Lightning do this off-season as they face cap issues with Brayden Point looking for a big contract. What will the Tampa Bay Lightning do this off-season? The Toronto Sun: Michael Traikos reports the Tampa Bay Lightning will be in big-time salary cap trouble the next few years. Nikita Kucherov’s new contract kicks in next year at $9.5 million (which is a steal). Defenceman Ryan McDonagh, who goes from $4.7 million to $6.75 million, and Yanni Gourde, who gets a $4.166-million bump from the $1-million he is currently earning. Anton Stralman, Braydon Coburn and Daniel Girardi are all unrestricted free agents at the end of this season and will likely not be re-signed because of salary cap restrictions. The Lightning have Brayden Point to re-sign and his agent has told the Lightning, Point will not talk contract until after the NHL season. Point will likely be asking for Kucherov salary at $9.5 million/year. The following season goalie Andrei Vasilevskiy and defenceman Mikhail Sergachev both require new deals. This off-season it is likely the Lightning trade trade J.T. Miller ($5.25 million) and Tyler Johnson ($5 million) or Alex Killorn ($4.45 million) to free up cap space needed for Brayden Point to be re-signed. The Score: The LA Kings are willing to trade defenceman Jake Muzzin but the asking price is a 1st round pick and a prospect. It’s not certain the Kings will deal Muzzin ahead of the Feb. 25 trade deadline, but they are listening to potential offers. Muzzin, 29, is having a solid season with 20 points in 47 games, second among the club’s defenders behind Drew Doughty. He leads all Kings blue-liners in both hits and blocked shots.